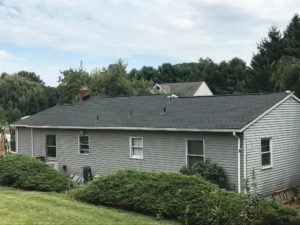 Forbes Design Center recently completed the re-shingling of a single family home in New Freedom, PA, where our clients were in need of updated roof. The roof needed to be durable enough to hold up to the up to the harsh weather conditions expected this upcoming winter. After examining the details of the building, and discussing potential solutions with the clients, our team got to work. The GAF Weather Stopper Roofing System technology allowed our team to install a product that is not only durable but also cost effective. Forbes Design Center provided the best value for a long-term investment by also installing the Timberline Lifetime High Definition Shingles in Charcoal. The Timberline HD® shingles will not only protect our client’s most valuable asset but also beautify their home for years to come.